« Slow – Advent Happening! It’s 2 am, no sound except the quiet snores of nearly fifty people who have spent the entire day on the streets and have nowhere else to lay their heads. But outside, it’s 25 degrees and the “official” homeless shelters in our city are full. So here, in the gym of First Baptist Church, we’ve distributed mattresses and blankets and pillows for a night of rest in safety and warmth. I’m spoiled, I don’t sleep easily in strange places, I like my warm cushy bed and my down pillow. So I’m up writing and thinking and praying. 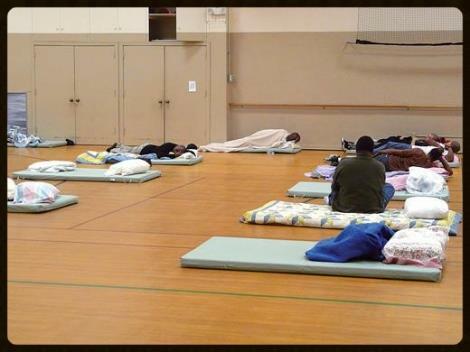 These folks have little choice where they sleep, they are so tired that a thin mattress on a gym floor is something to be grateful for. Before going to bed, many of them gathered in a prayer circle to share their thanks to God. How many of the rest of us went to bed in our comfortable homes in warmth without a thought or nod of gratitude to the Maker? How many of us went to bed complaining that there was nothing worth watching on our 500 channel cable TV, grousing that Leno was a rerun? The people of God work together to meet the need. We need two volunteers every night. We need volunteers to donate food, donate toiletry kits. The wonderful middle school group in our church is putting together toiletry kits. The senior highs have donated food bags. There’s something anyone can do. Jesus said, when you did it to one of the least of these… you did it to me. Can you help? SIGN UP. This entry was posted by PastorJohn on December 11, 2013 at 7:26 am, and is filed under Christian Life, Gratitude, Homeless, Mission, Service, Thankfulness. Follow any responses to this post through RSS 2.0. Both comments and pings are currently closed.